* Start of setup times is an estimate provided by our contractors - these might differ slightly on the Friday build day depending on the progress in shell scheme and electrical builds. NOTE: Caterers are required to set up on Friday between 12pm - 2pm, to allow time for caterers to set up and have their electrical appliances inspected on Friday evening. Please visit the page here for full directions to the venue. Entrance (resp. exit) for stallholders during the setup (resp. breakdown) periods is via the G Gate on Blythe Road. Upon arrival, please use the appropriate Goods Lifts (see Goods Lifts section) to enter the interior of the venue, then please show your entry passes to the organising team at the Stallholder Registration Desk inside the venue. Then you will be issued 4 wristbands, for identification by venue staff and security for the rest of your stay at the event. Please refer to the map here for the locations of the Lifts mentioned above - the exact dimensions and weight limits of all lifts involved are included at the bottom left corner of the map. This is to inform the venue's traffic control team of the time slots during which vehicles will be unloaded at the loading bay for setup and loaded up at the loading bay during breakdown. The venue can then ensure that the loading bay is not overly congested at any one point during setup or breakdown. If you are unsure yet as to when you're going to arrive during setup, please note that Voyage Control is also available on smartphones (Google Play / iTunes), which enables you to book your time slots whilst on the go. the Green Zone (if you are located in Olympia WEST Level 1). See map here for an illustration of the various coloured zones of the venue. Please note: All CATERERS must set up on the Friday before the event, with their electrical equipment to be tested on site on the Saturday morning before the event opens. To book your load-in slot, please choose Open (for the Phase) and then choose your preferred load-in slot on the Saturday. To book your load-out slot, please first choose Saturday only exhibitor for the User Type, then choose Open (for the Phase) and then choose your load-out slot on Saturday evening. To book your load-in slot, please choose Open (for the Phase) and then choose your preferred load-in slot on the Sunday. To book your load-out slot, please choose Breakdown (for the Phase) and then choose your preferred load-out slot on the Sunday. To book your load-in slot, please select "Vegfest caterers" for User Type, then on the following page, select your preferred slot on Friday. We advise that you arrive as early as possible to allow ample time for health and safety, and electrical, inspections on Friday. Should you need to restock on Sunday morning, for your load-in slot on Sunday, please select "Exhibitor - Olympia West Level 1", then on the following page, select Open (for the phase), and then your preferred slot on Sunday for restocking. To book your load-out slot on Sunday (during Breakdown), please select "Exhibitor - Olympia West Level 1", then on the following page, select "Breakdown" (for the phase), and then your preferred slot on Sunday for loading-out. We encourage stallholders to be equipped to accept card payments from visitors during the event. There are a limited number of cash machines at the venue which, from experience, might run out of cash during the event due to the high volume of spending expected from visitors to the event. Please see "Internet" section for info on ordering internet for taking card payments. All space only stands will be inspected and certified by an independent structural engineer on site. They will only be allowed to trade once the engineer is satisfied that the structure is safe and has provided certification. All online competitions must end by the end of August at the latest, and VegfestUK reserves the right to request any online competitions running beyond the end of August to cease immediately. Exhibition materials for exhibitors will only be accepted at the venue between 10am - 6pm on Friday, and between 7am - 9am on Saturday. only low-tak adhesives can be used on the shell scheme walls. Click here for an example. Velcro is NOT allowed on the walls of the venue. Any damages to the walls / shell schemes will incur a dilapidation charge which will be passed onto the exhibitors concerned. Electricity and lighting should be booked directly with Moyne, official contractor for electrical services at the show. Please note: electricity and lighting can only be booked at stalls highlighted in yellow on the floor plan. Deadline for earlybird discounts on electrical / lighting is September 28th 2018. • Electrical fittings should be ordered from the appointed contractor Moyne using the order form above. • All electrical equipment and exhibits must be guarded to prevent accidental contact with live terminals. Items intended for use on stands must be PAT tested and labelled accordingly. • Electrical cables must not be run under carpet or up stand fitting support posts. Cables on the floor which may be walked on must be protected by conduit or with protective ramping (tape is not acceptable). All other wiring below 2.4 metres must be protected in PVC or metal tubing. • In the event of electrical failure, please report this to the organisers’ office. • Light fittings must be secured using clips or heavy-duty electrical ties and earth bonded appropriately. • Light fitting flex must not be draped across the ceiling grid (if applicable), or left hanging in coils or wrapped around any part of a metal structure. Cable ties must be used to secure flex to the structure. • Spotlights/floodlights/halogen lamps, etc must be guarded and mechanically fixed, so as to prevent the risk of injury to persons. • All lighting must be kept at least 300mm away from muslin/fabric ceilings and other combustibles. • Lighting circuits must not exceed 1,000 watts. They must not be looped or connected to power circuits. • Heavy fittings (over 1 kg) require a secondary means of support. • Only one 4-way extension lead may be connected to each socket outlet and the maximum length of lead permitted is 2 metres. • Extension leads must not be plugged into other extension leads (commonly known as ‘daisy-chaining’). • Block adaptors and drum reel extension cables must not be used. All caterers must check the startup and cruising wattage of their electrical appliances. For example, an appliance could have a cruising wattage of 2.8kW, which is suitable for a 3kW (3000 watts) power socket, but the appliance may require a 3.8kW start-up power supply. If a 3kW socket has been ordered the power is insufficient to start up the appliance and the power supply will be cut off at the RCD box located on the stand. Multiple appliances starting up with insufficient power will terminate power to the venue mains supply and all stands served by that supply. Under no circumstances are exhibitors permitted to interfere with the power supply. This includes the RCD box installed by Moyne to each stand and the venue mains supply box. Power and sockets will be removed to any stand that is found to have done this. Power failure must be reported to the Information Desk during open hours. The standby electrician will then attend. To ensure that sufficient power is ordered exhibitors must either refer to the manufacturer's handbook / contact the manufacturer direct. In the case of hired equipment, ensure the hirer provides all relevant power supply information. The electrical contractors, Moyne, can provide advice, however, they are not responsible for or liable for guaranteeing the power supplies of exhibitor’s appliances. Each caterer must submit proof that all their electrical equipment has been PAT tested within 12 months of the show. Please note: this is a legal requirement and this will be strictly enforced before trading commences. All catering appliances must arrive on Friday (setup) to allow time for inspection of electrical equipment and power usage. 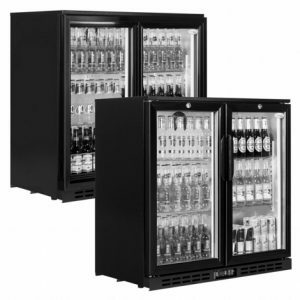 This to avoid caterers arriving just before show opening powering up simultaneously and a series of electrical mains supply failures occurring during prime sales time. Floor loading capacities vary considerably throughout the venue, so please notify the organiser of any unusually heavy items to be brought on site/exhibited. 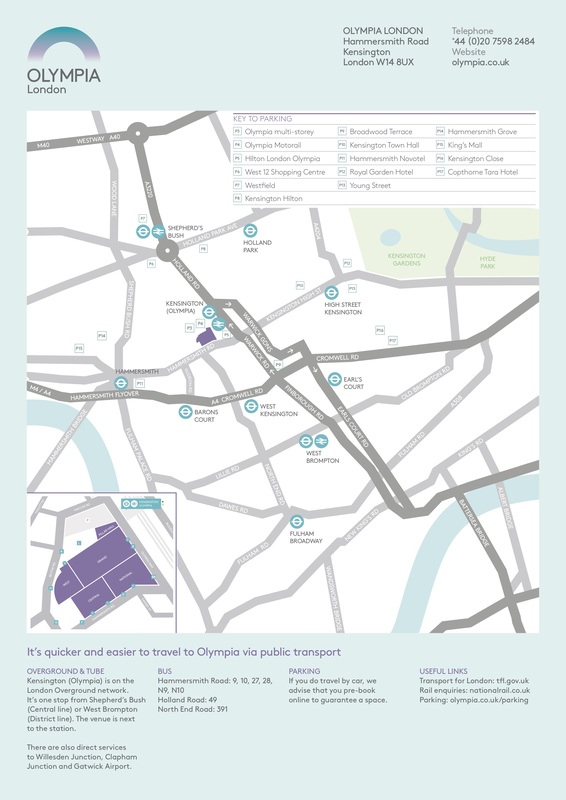 Please refer to the map here for dimensions and weight limits of all goods lifts at Olympia London (with dimensions and weights of lifts indicated at the bottom left of the PDF). 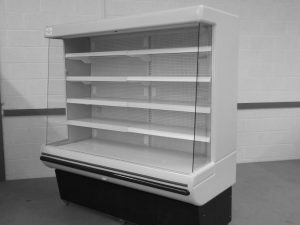 Please complete the order form here and return it to Display Refrigeration using the contact below, by the deadline of October 22nd 2018. Furniture should be ordered using the online booking form for stalls here. Any furniture ordered with the organisers will be laid out at your stall before your arrival on Friday setup day. The deadline for ordering furniture is Thursday September 20th 2018. Please consider the safety of your staff and visitors to the show when planning the layout of your stand. Hazardous items, such as knives and hot equipment must be set back from the stand and out of reach of the public. Guards will be required to shield anything emitting heat and any machinery or other equipment which may present a hazard to visitors. The use of real flame (eg candles) must be agreed in advance of the event. The venue provides a free Wifi service which is suitable for casual browsing only – it is not a secure connection and hence not suitable for transactions or streaming of large amounts of data. If you require a secure broadband for the duration of the event, please complete the form here and return it to E-Force, internet suppliers of the venue, at sales@eforce.co.uk by September 28th 2018. We do not recommend using 4G networks for secure transactions. Exhibitors who need to run secure transactions on their devices are advised to book internet in advance. If you do not need a support cable, the Wifi option (up to 2MB for 1 device) is recommended. For full range of options offered by the venue, see the order form at the link above. Licence application (if needed) must be with the London Borough of Hammersmith & Fulham no later than 28 days before the event. non-invasive hands-on treatments, such as massage, reflexology, manicures and pedicures. invasive treatments such as skin piercing, acupuncture, tattooing, electrolysis, cosmetic piercing, micro-pigmentation and botox. All exhibitors must complete and return all necessary paperwork by return on booking their stalls, using the form here. Please pay particular attention to public liability (covering up to £10M) and employers liability insurance and make sure your insurances are up to date on the event dates (October 27th 28th 2018). Please note that we CANNOT accept out-of-date insurances. One of the many sources available online for getting insurance for your stall is here. It provides 1-year insurances for traders of all sizes, with PLI covering up to £10M. This company here offers temporary insurances with PLI covering up to 10M. Overseas exhibitors are advised to contact their own insurance companies to ensure an adequate extension of their own insurance to cover events in the UK. Temporary event insurance generally requires a UK-based address for applications. Also all food caterers must return their food safety questionnaire as well as any required food hygiene certificates. Please also pay attention to the expiry dates of all food hygiene certificates and certificates of registration with your local councils, and renew these certificates if necessary. Please also note that it is the exhibitor's responsibility to complete their own risk assessment and method statement (as mentioned here), and adhere to all electrical and fire regulations (inc. naked flame, LPG) - please see "Electrical Safety" section of the exhibitors manual for electrical regulations, and "Fire Safety" section for fire regulations. 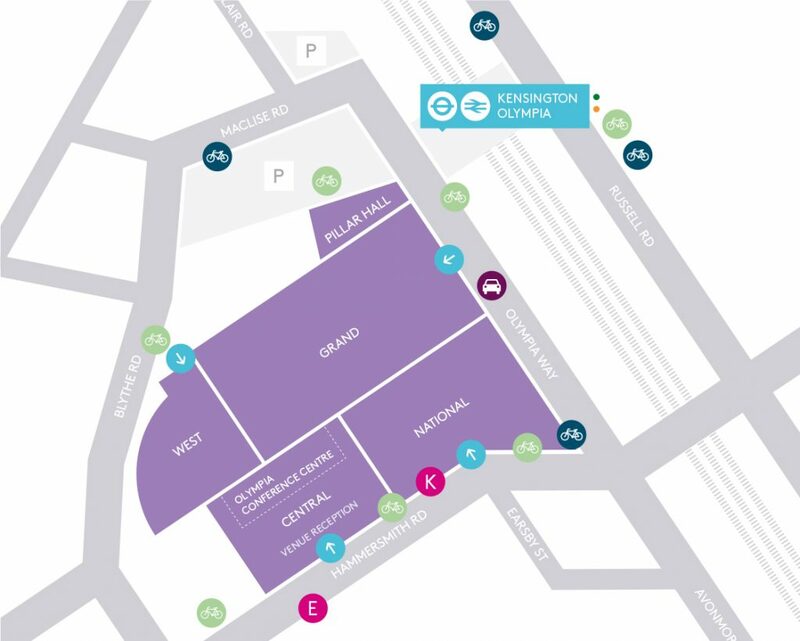 Parking is NOT included in the stall prices – this needs to be booked separately by stallholders. Stalls highlighted in yellow or purple on our floor plan are equipped with a shell scheme with nameboard containing the exhibitor name, whilst those highlighted in blue are space-only stalls with no shell schemes. To request specific names to be used for your nameboard, please complete the Nameboard Form here, and return it to Moyne by October 15th 2018 at the latest. If you would like to order your nameboard, electricity, furniture or graphics we advise, that to save time completing multiple forms, you complete the editable Moyne Express Order Form here. If you have questions relating to your order or if you would like to speak to Moyne direct please contact Sara Binns on 020 8997 8596 or email info@moyne.co.uk. Shell scheme walls are composed of 1.0m wide x 2.5m high white foamex modular panels (3mm thick). Graphics that are intended to go on shell scheme panels between adjacent poles should adhere to the dimensions of 950mm wide x 2340mm high. ALL shell scheme exhibitors must return the nameboard form under "Shell Scheme Nameboards and Features" on this page here by the required deadline of October 15th 2018. In the absence of a form, names will be printed from our exhibitors list. Any changes required onsite are charged at £27.00 +vat per board. Contractors must wear suitable personal protective equipment at all times during stand build. No open-toed footwear is allowed for workers involved in stand build. Workers involved in stand build must wear high-viz clothing. Limited storage space is available to rent in Olympia Central Level 1, at a cost of £100 + vat per square metre (pallet). Stock is secure and guarded but is left at the exhibitors’ own risk. If you have already booked cold storage, and are planning to have delivered to the venue, items that require cold storage before your arrival, please be aware that power will be live at the venue over the course of the afternoon on Friday setup day, and the event’s cold storage unit will not be operational until power is live. there is no option for onsite storage outside of the event tenancy period (which starts from 7am on Friday and ends at 10pm on Sunday). Items may not be stored behind or between stands or in void areas of the hall. Items found outside the designated stand or storage areas will be removed as rubbish. Please get in touch with the office first at chris.vegfestuk@gmail.com to check the availability of space left for both standard storage and cold storage. Storage should be booked in advance using the online booking form for stalls here. Should you require floorcovering at your stand, please refer to "Shell Scheme Nameboard and Features" section on our Exhibitors Resources page here. Meanwhile, Olympia Central Level 2 and Olympia Conference Centre (Level 3) are carpeted. The venue provides emergency first aid assistance to anyone who needs it. Please contact the nearest security personnel or the organiser’s office for help. Alternatively, there is a first aid room on the Gallery/Level One, from where help can be summoned - see floor plan here for the location of the first aid room. If you believe an ambulance needs to be called, please ensure that this request is directed to the venue’s control room on 020 7598 2666. The staff’s knowledge of the venue and where to direct the ambulance could save vital time. The organiser will be able to direct you to a pharmacy close to Olympia London for supplies of plasters, headache tablets, etc. Toilets are available in all 4 exhibition halls used for this event. Accessible toilets and baby change are available in all 4 halls. Gender neutral toilets are located in Olympia Central Level 1 (next to the Mature Zone on the floor plan). There will be ample rubbish bins for clearing out rubbish. Please separate these items from your general stand waste for collection. All cooking oils need to be removed from the venue in sealed containers. There are no facilities on site for cooking oil disposal. The tenancy period of the show for exhibitors ends at 8pm on Sunday. Any stand materials not collected by that time will be disposed of. Exhibitors and their contractors must remove excessive or hazardous waste at the end of the show, otherwise charges will be incurred. Please see the document here for costs to be passed onto the exhibitors in question for various categories of stand materials left at the venue after the show. quantities of unsold stock or ‘give-aways’. The Water Point is located in Olympia West Level 1, just next to the Vegan Food Village. Electrical fittings should be ordered from the appointed contractor Moyne using the order form above. Light fitting flex must not be draped across the ceiling grid (if applicable), or left hanging in coils or wrapped around any part of a metal structure. Cable ties must be used to secure flex to the structure. Spotlights/floodlights/halogen lamps, etc must be guarded and mechanically fixed, so as to prevent the risk of injury to persons. All medical emergencies, including requests for ambulances should be reported to the venue’s Control Room immediately on 020 7598 2666 (internal 2666). Please do not call the emergency services directly, as this could waste vital time and result in inaccurate location and medical information being communicated to ambulance crews. Olympia London provides first aid assistance. Security personnel or the organiser should be contacted for help in the first instance. Alternatively, there is an emergency telephone with a direct link to the Control Room outside the venue’s first aid room, which is located on the Gallery/Level One. Do not leave the building. Inform your colleagues, and then assist in searching for suspicious objects in your work area. If you find a suspicious object, do NOT touch or move it. Clear the area of people calmly. Report to Control on 020 7598 2666 (internal 2666) giving the exact location of the object. Please do not cause undue concern to visitors at this stage. If you receive a bomb threat directly on the stand, please obtain as many details as possible (see form overleaf), and then inform Control on 020 7598 2666 (internal 2666). If you discover a fire, or a fire is reported to you, operate the nearest fire alarm call point FIRST, then inform Control on 020 7598 2666 (internal 2666). If evacuation is necessary, you will hear the following announcement: “ATTENTION PLEASE. ATTENTION PLEASE. HERE IS AN IMPORTANT ANNOUNCEMENT. IT IS NECESSARY TO ASK EVERYONE TO LEAVE THE BUILDING. PLEASE MAKE YOUR WAY CALMLY TO THE NEAREST EXIT. EVERYONE WILL BE RE-ADMITTED AS SOON AS POSSIBLE.” Please leave the building by the nearest exit and assemble at your assembly point (Olympia Way, G Gate or L Yard), or in the event of a wider cordon, at Brook Green. Exhibitors and contractors should account for all their staff and report to Control on 020 7598 2666 (internal 2666). The signal for a return to work is made by the cancellation of emergency procedures. The search procedure is cancelled by the announcement: “ATTENTION PLEASE. ATTENTION PLEASE. STAFF CALL 100 IS CANCELLED." Olympia London strives to maintain a high level of safety during events to protect all staff, organisers, contractors, exhibitors and the many thousands of people that visit the venue. British Standards are the minimum acceptable standards. You may submit samples of materials to the venue for approval before the event and the venue may test materials on site to ensure compliance. To be treated with ALBI MAX basecoat and overcoat to achieve ‘Class 1’ Surface Spread of Flame. Also supplies water-based paints. Exhibitors should order their electrical fittings from the appointed contractor. In the event of an electrical failure, the matter must be reported to the organisers’ office. DO NOT tamper with the fuse board. Only qualified electricians may access the fuse box. Ask for help at the service desk. DO NOT wrap cable around metal objects. The cable should be clipped to the top edge of the stand as part of your lighting connection. DO NOT use multi-way adaptors. These are not suitable for use in commercial premises. Use an extension lead. DO NOT allow conductors to become exposed. The inner coloured sheathing is to protect the conductors; the outer sheathing is to protect you. DO NOT let cables drop to the floor unprotected. Exposed cables must be in a conduit or mini trunking. All electrical equipment intended for use on stands must be PAT tested and labelled accordingly. Cables must not run under carpet. If they run across the floor ensure they are covered by conduit or protective ramping (tape is not acceptable). Cable ramping stops trips and prevents damage. All lighting must be kept at least 300mm away from fabric ceilings and other combustibles. All light fittings must be secured appropriately and heavy light fittings must have a secondary means of support. Ask us and we will help you get it right! If you are a victim of theft or damage, please report this to your nearest security personnel or steward. The organisers, however, cannot be held responsible for the loss or damage to your property. Contact email for lost property post-event: LostProperty@olympia.london / 020 7598 5518. Security is provided for the show from 8am on Friday until 10pm on Sunday. Please do not arrange for goods to be delivered to the venue before this time. Please assist us by wearing your wristbands within the venue at all times after you have picked these up on arrival. Arrive in time for the show. Ensure your stand is staffed at least 15 minutes before show open time of 10am on Saturday and 10am on Sunday, but remember that the venue is open for setup from 8am on Saturday and from 8am on Sunday. Any lost kids should be reported to the Information Desk in Olympia Central Level 1. Smoking / vaping is not permitted by law anywhere within the indoor areas of the venue. Please get in touch with the office at chris.vegfestuk@gmail.com or on 01179071881, by Friday October 19th 2018 if possible, as the office will be very busy in the week leading up to the event.